Though the Municipal Corporation (MC) has spent crores of rupees on building raen basera (night shelter) for homeless people outside the railway station at Gol Bagh, it hardly finds takers. The construction of the new building for the night shelter has been completed. There are 50 beds for men and 50 for woman. 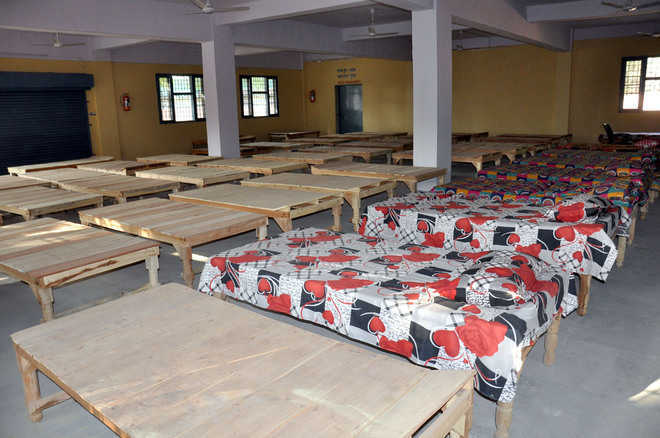 The MC hasn’t inaugurated the new building, so the night shelter has been running in adjoining Yatri Ghar, which has 16 beds. Whenever the district administration removes beggars from the markets and footpaths, the night shelter witnesses temporary rush. There is no arrangement of food at the night shelter so the homeless do not stay here permanently. Another reason behind the disinterest is the requirement of identity proof which most of the homeless people don’t possess. The management doesn’t allow people without Aadhaar card to stay here. Most of the homeless people don’t have any identity proof. Apart from the Red Cross Society, there are seven night shelters in the city. Some of the night shelters are well equipped. The Shiromani Gurdwara Parbandhak Committee offers free food for all the night shelters. With the dip in mercury, the number of the visitors often increases. Ram Kumar, a construction worker from Uttar Pradesh (UP), has been staying outside the night shelter. He fell from the stair of a construction site and got his hip bone fractured. A social worker arranged his treatment and dropped him at the night shelter. Now, Ram stays with them and the social worker has been providing him food, bed and medicine.